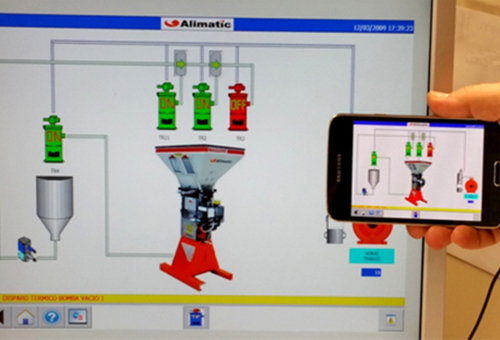 At Alimatic, we have been recently working on the development of a new App that allows you the total data control of the conveying installation through Smartphone or Tablet devices that is already available in the market. This App available for Smartphones or Tablets screen and through Wi-Fi connection, allows you to visualize and interact directly with the central control panel of your installation. All this is possible in your palm of your hand without having to be physically present in front of the control panel. This new traceability control App developed by Alimatic it’s a smart solution that complies with the customer’s requirements and needs of the current trend of automation and data exchange in manufacturing plastic technologies: the #industry 4.0. For furthermore information about this App for Smartphones or Tablets, please contact us in the contact section.